Vibrant as a painter’s palette, the Fischer’s lovebird is a sight to behold, from its tangerine-colored face to its minty-hued tail feathers. They have a scarlet beak and a white ring around each eye. Beautiful, playful, and energetic, this vivacious species is sought after by lovebird enthusiasts. Although not known for any talking talents like larger parrots, they still find favor thanks to their fun-loving personality. They are gregarious, social birds that form monogamous pairs. Also called short-tailed parrots, the nine recognized species of lovebirds make up the genus Agapornis. Of this genus, four are classified as “eye ring” species: the masked, black-cheeked, Nyasa, and Fischer’s lovebirds. 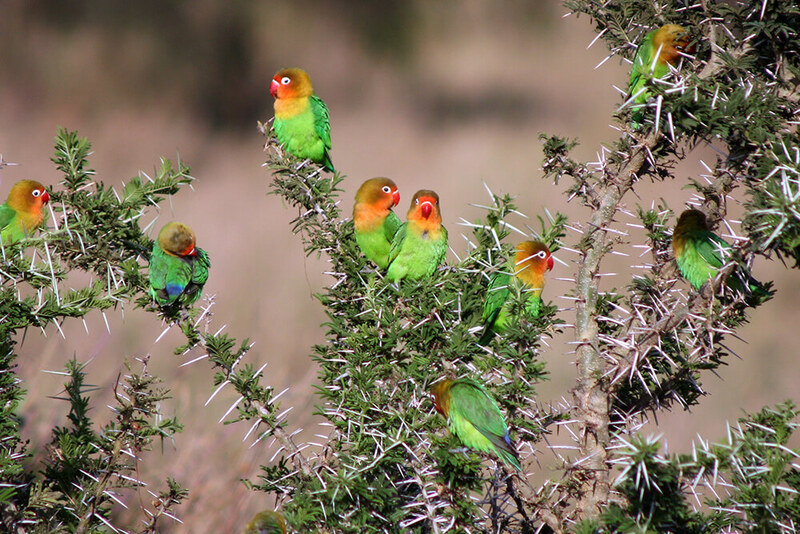 Fischer’s lovebirds experienced a rapid population decline in their restricted range due to trapping for export. Fortunately, this practice has largely been halted and it is hoped that the “feral” populations will rebound. Green backs. 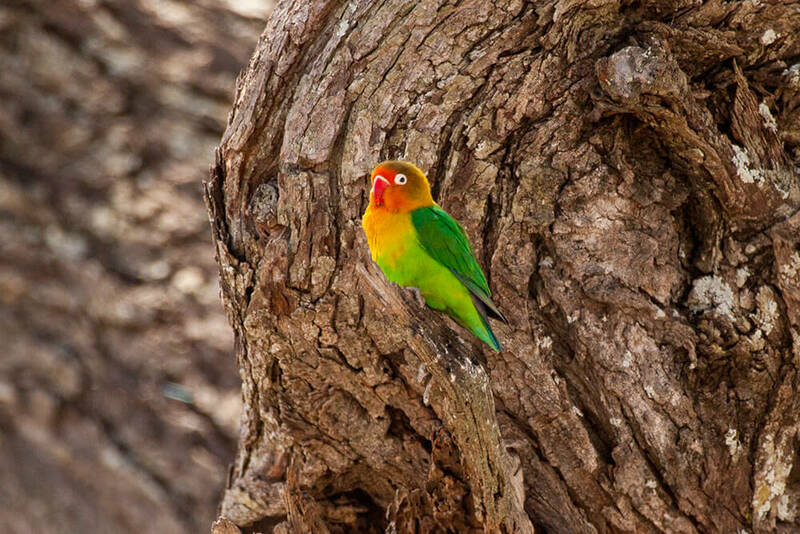 The Fischer’s lovebird has a green back, chest, and wings, and its neck glows golden yellow upward to its sunset orange-colored head, leading to a flaming red beak. Upper tail feathers can have purple or blue highlights. Mutations in the birds’ coloration occur, and bird breeders will sometimes select for those anomalies. Flit and feed. The Fischer’s lovebird is endemic to north-central Tanzania, where they flit about in grasslands, savannas, and scrub forests. They can also live near areas with crops and other agriculture. Flocks of 10 to 15 birds inhabit grassland areas, among the acacia and baobab trees, while vast flocks of one hundred or more birds use cultivated areas among the millet and maize crops. Its southern and western limits in Tanzania appear to be due to unsuitable vegetation. Seedy meals: Fischer’s lovebirds feed largely on seeds and occasionally on fallen berries and fruits. Sometimes they attack ripening agricultural crops (maize and millet) and their flocks can swell to several hundred birds, so farmers consider them pests. The birds also need to drink water each day. Heavy drinkers: Fischer’s lovebirds live near water sources, as they must drink daily. They are reluctant to migrate and will only do so if water becomes unavailable. On hot days (which is often), they can be found near water holes, where they can slake their thirst throughout the day. Best nest. Fischer’s lovebirds nest after rainy periods, when food is plentiful. They are colonial cavity nesters, staking out natural openings in trees, rocks, or buildings to construct their nests. The nests are made from grass, stalks, and bark, and they even construct a domed roof over them! They will also use communal weaver nests. Tweets and twitters. This lovebird’s calls are high pitched and twittering. They also use whistling with sharp or melodious notes, though some “songs” are shrill and harsh. They are small sized, but make up for it by being quarrelsome and bold. Lovebird life. These lovebirds are aptly named, as they form strong bonds with their mate and are monogamous for life. They are affectionate toward each other, biting and nipping their chosen one’s beak, a behavior that resembles kissing. Males and females sport the same colorful plumage and are the same size. Youngsters are duller in color, with brown markings on at the base of their mandible, but they grow into their adult vibrancy at about one year of age. Breeding season is January through April and June through July. The eggs are white, usually three to five in a clutch. Males feed their mates while the female incubates the eggs, and both parents feed the hatchlings. This type of alloparenting is common among parrots. Youngsters fledge at around five weeks of age. Watch out! Predators include the lanner falcon Falco biarmicus, one of the few raptor species to engage in cooperative hunting. The lovebirds seek refuge in thorny bushes when danger strikes. Threats to lovebirds. Although the Fischer’s lovebird is still common in some areas, and large numbers are kept as pets around the world, native populations may be endangered by the cage bird (pet) trade, as well as the bird hybridizing with the yellow-collared lovebird. You can help us lead the fight against extinction by supporting the conservation work of San Diego Zoo Global. In 1987, the Fischer’s lovebird was the most commonly traded bird in the world, leading to its population decline. This pint-sized parrot is named after German explorer Gustav Fischer. 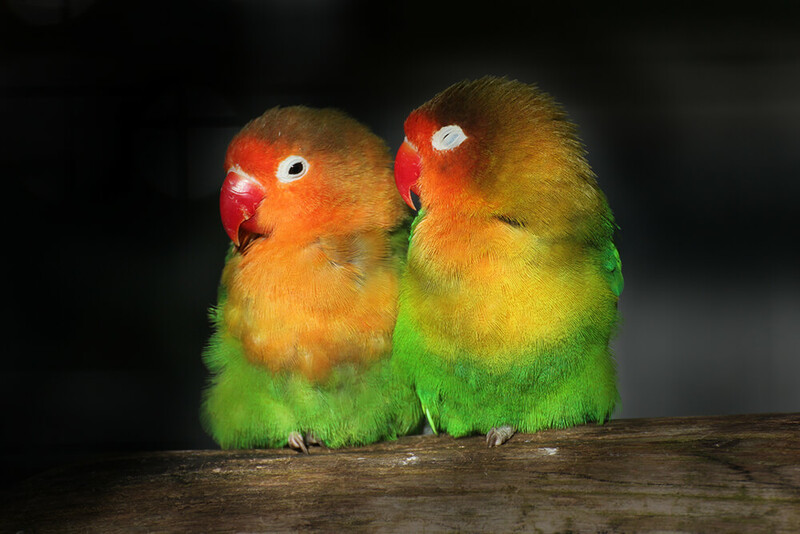 Both male and female Fischer’s lovebirds look identical, making sexing them difficult. They were originally “discovered” in the late 1800s, and by 1926, they were being bred in the United States. Lovebirds can have acquired piedness, meaning that after a molt, their feathers can come in colorfully jumbled. Feral populations of Fischer’s lovebirds present in Mombasa, Kenya and elsewhere can hybridize with yellow-collared lovebirds Agapornis personatus.